Agricultural Extension Department Job Circular 2018 has been published. The Department of Agricultural Extension (DAE) has been circulated various type of job position. These job titles are as follows Sub Assistant Agricultural Officer position you can apply. These job positions are the total number of vacancy of one thousand eight hundred forty-seven (1847). Agricultural Extension Department job application is deadline 22nd November 2018. Interested candidates are applying the Department Agricultural Extension application peskiest format. If you can want to this application form then download this form my site. Department Agricultural Extension Job position is 13th (Grade). ■ Job Description: This job position is 11 (Grade) employee of the Department Agricultural Extension division. ■ Compensation and Benefit: As per Government pay scale. 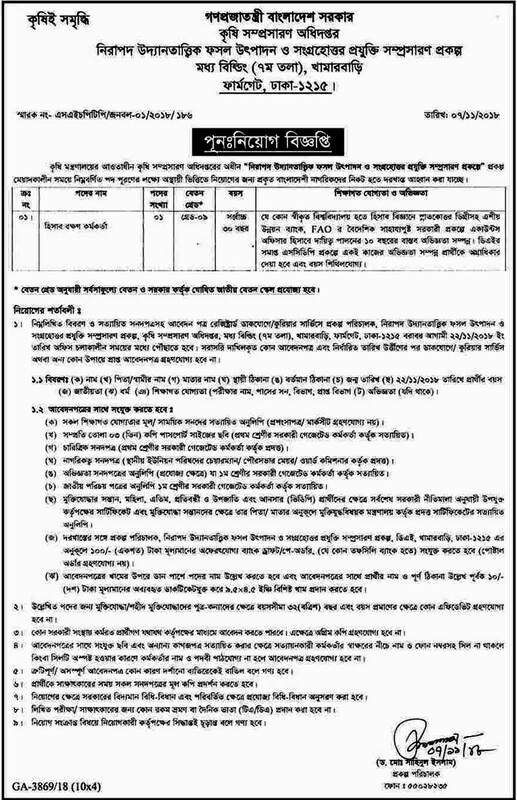 ■ How to Apply: Apply with full Resume to Director, Administration, and Finance Wing, Department of Agricultural Extension, Khamarbari, Farmgate, Dhaka-1215. ■ Age Limit: 18-30 years and child of freedom fighter 32 years. The Department of Agricultural Extension (DAE) is a service-oriented government organization under the Ministry of Agriculture. It encourages the various partners and agencies within the national agricultural extension system to provide efficient and effective services. Department of Agricultural Extension (DAE) ensures the extension services to the farmer irrespective of their class and categories. The Department of Agricultural Extension (DAE) job position is 11 (Grade) employee job.